CARICABATTERIE/ALIMENTATORE MULTI USB HD SERIES DA CASA/UFFICIO, TENSIONE D'INGRESSO 230VCA 50/60 HZ, 8 PORTE USB PER ALIMENTARE CONTEMPORANEAMENTE 8 UTENZE. 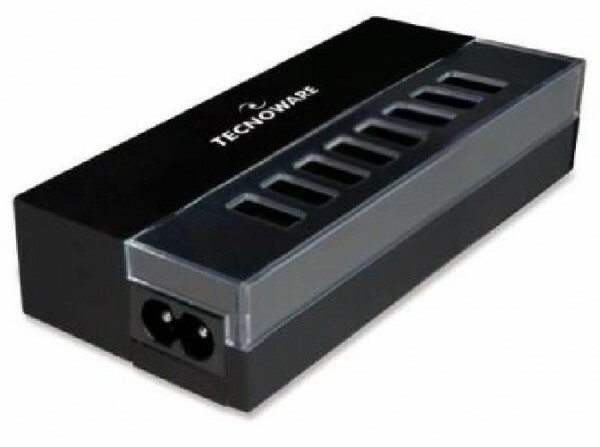 USCITE USB: 5VCC - 2.1 A (10W MAX) CIASCUNA, DOTATO DI CIRCUITO ELETTRONICO PER GARANTIRE L’OTTIMIZZAZIONE DEI TEMPI DI RICARICA E LA PROTEZIONE DELLA BATTERIA, DESIGN COMPATTO CON GOMMATURA SOFT TOUCH. ADATTO PER LA RICARICA DI SMARTPHONE, TABLET DI OGNI GENERAZIONE, NAVIGATORE SATELLITARE, FOTO/VIDEO CAMERA, LETTORE MULTIMEDIALE MP3/MP4, IPAD, IPHONE, IPOD E PER L'ALIMENTAZIONE DI QUALSIASI DISPOSITIVO DOTATO DI PLUG USB.